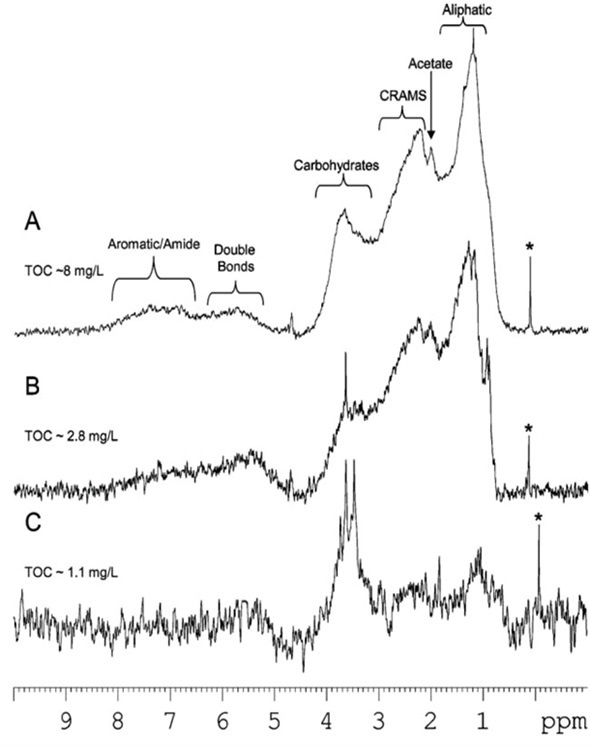 Nuclear magnetic resonance (NMR) spectroscopy is a powerful research technique that exploits the magnetic characteristics of certain atomic nuclei. It is used to elucidate structure and understand molecular interactions and serves as a useful tool in environmental studies. In this article, NMR is applied to natural water samples without any pre-treatment. Figure 1 shows the use of W5-Watergate water suppression, which suppresses the water signal below the spectrometer noise. Figure 2 shows the ocean, lake and river dissolved organic matter (DOM) at natural abundance. Although time consuming, the profiles of DOM at natural abundance supply a snap shot of the environment’s true state, making it possible to evaluate common isolation processes. Figure 3 shows the molecular characterization of the DOM of arctic ice. A large number of tiny molecules including short chain acids and amino acids are found and 80% of the total organic carbon (TOC) can be accounted for at natural abundance. Plants, tissues, soils and other more complex environmental samples are difficult to analyze using traditional NMR spectroscopy because such samples contain numerous physical states. Therefore, innovative NMR technology is needed. Bruker has collaborated with the Environmental NMR Center (University of Toronto) to develop comprehensive multiphase NMR or CMP-NMR, which integrates the capabilities of liquid-state, solid-state and gel-state NMR into one approach. This technology makes it possible to detect and differentiate all liquids, solutions and gels in intact, unchanged samples in their natural state. Figure 4 shows the analysis of intact 13C labelled seeds and Figure 5 shows the capabilities of analyzing dynamic processes. During germination, it was possible to track the conversion of lipids to carbohydrates and to identify a wide range of structural and metabolic alterations during growth. Multidimensional CMP-NMR enables detailed structural assignments. 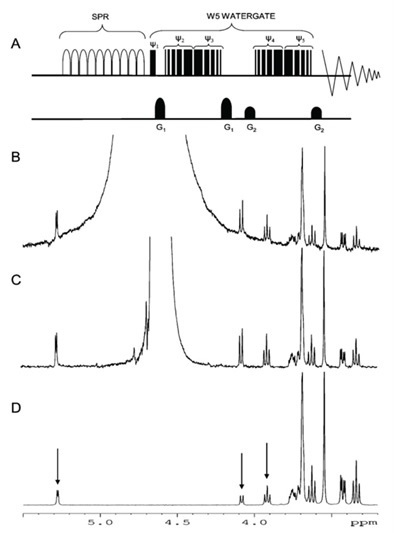 In Figure 5, Arabidopsis seedlings were analyzed in their natural state without pre-treatment. Two dimensional analysis helps resolve overlapping peaks, enabling molecular-level characterization and peak assignments. In general, CMP-NMR has a wide range of applications in environmental science. It removes the need for pre-treatment/extraction and allows holistic study of the environmental samples. This technology shows great potential for studying in-situ molecular interactions. Limitations in analytical instrumentation have made it difficult to study the structure and composition of soils. Using CMP-NMR spectroscopy, it is possible to analyze soil in its native state, meaning chemical composition and molecular interactions between soil components can be understood. A 2D heteronuclear experiment was used to compare an overlay of four key soil components including protein, lignin, carbohydrates and aliphatics (Figure 6) in soil with a whole soil sample. All major peaks in soil are accounted for in the overlay. Using different solvent systems (Figure 6), it is possible to establish how these components interact with one another. While lignin and proteins are water inaccessible, polar aliphatic groups and carbohydrates orientate towards the water. Lignin and proteins become available when hydrogen bonds are disrupted. A large amount of the protein in soil seems to be inside microbial cells. 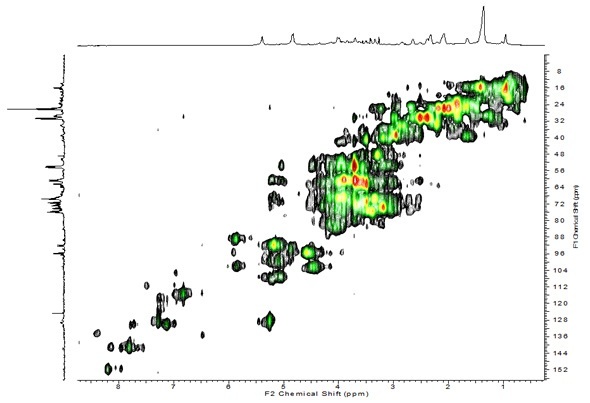 CMP-NMR spectroscopy can be used to analyze samples in their intact state and is ideal for researching molecular interactions. In this case, an innovative experiment referred to as Reverse Heteronuclear Saturation Transfer Difference is employed to examine the binding of contaminants in whole soil. 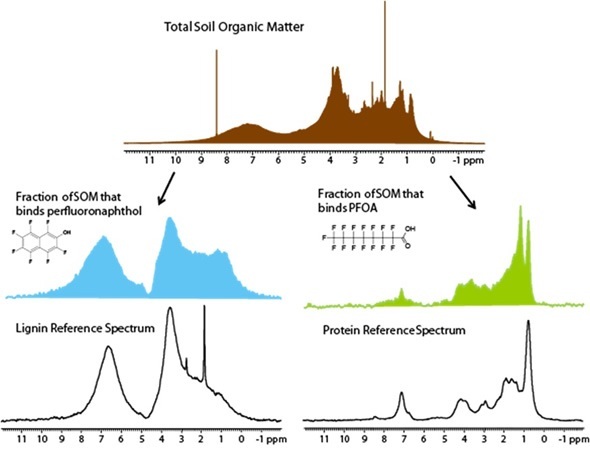 This works by passing saturation from the 19F found in the contaminant to the 1H protons in the soil organic matter in close proximity (Figure 8).This provides an NMR spectrum of only the fraction of organic matter that binds to a contaminant. 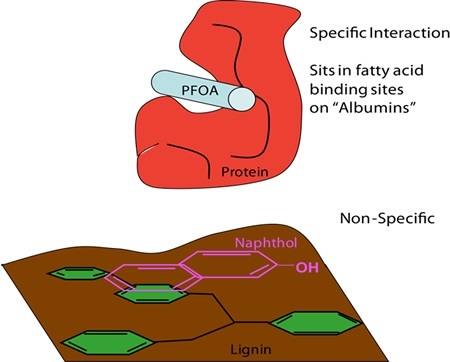 PFOA selectively binds to soil protein, whilst perfluoronaphthol shows preferences for lignin (Figure 9). In order to understand real-time biomolecular stress, it would be best to analyze organisms in vivo. 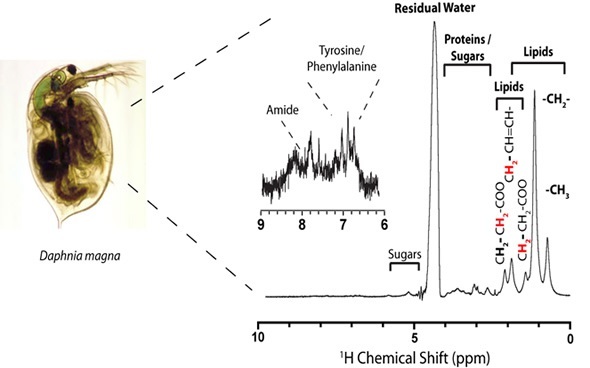 To that end, a new technique has been designed to analyze Daphnia magna in a 5mm-NMR tube using a flow system (Figure 9) developed in house. 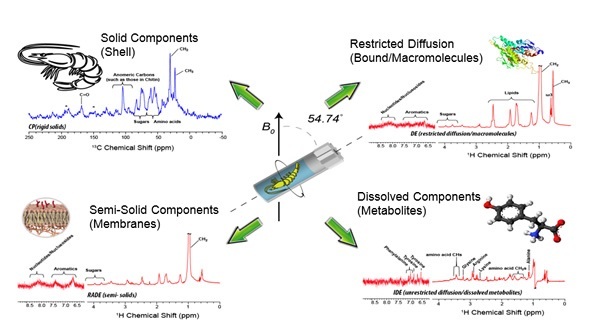 13C labelling with labelled algae enables multidimensional analysis in the liquid state, A less stressful environment is provided by solution NMR-based studies, but these are limited to analyzing relatively mobile chemical constituents (mobile gels and solutions). 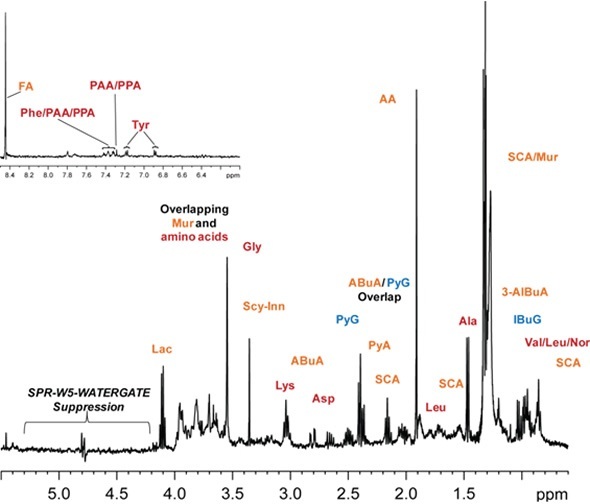 CMP-NMR spectroscopy was used to analyze Hyalella azteca, making it possible to ascertain the molecular composition of all the components ranging from solution through to solids, within a living organisms for the first time (Figure 10) by NMR. Although spinning is stressful for the organism, it enables contaminants to be detected in all phases in vivo and also makes it possible to correlate the state of the contaminant with both metabolic and structural changes such as shell thickness and protein and lipid membrane disruption. Detection of cellular response in relation to contaminant exposure allows policy makers to direct their attention towards treatment, remediation and prevention efforts for certain problematic target chemicals. In vivo data is of physiological significance, enabling researchers to examine the contaminants’ toxic mode-of-action and relate metabolic flux to protein and genetic expression, which are fundamental in a range of diseases. Lam and Simpson. Analyst. 2008. 133. 263-269. Pautler et al. Environ. Sci. Technol.2011. 45:11. 4710-4717. Courtier-Murias et al. J. Mag. Res. 2012. 217. 61-76. Lam et al. J. Agric. Food Chem. 2014. 62 (1). 107–115. Wheeler et al. The Plant Journal, 2014, in prep. Masoom et al. Nature Geosci. In prep. D’eon et al. Environ. Toxicol. Chem. 2010.29:8 1678-1688. Longstaffe et al. Environ. Sci. 2010.44:14. 5476-5482. Liaghati et al. Nat. Methods. In prep. Akhter et al. Preliminary data.